Real time Gantt Chart; find a perfect status updates. Try not to neglect any fact. Everything about your project is obviously recognized so nothing gets disregarded: tasks, milestones, undertaking records, dependencies, assignments, the rate finish and partial all have their own background shading color codes; the late items are highlighted in red. The segments relating to holidays and ends of the week are likewise set apart out with the goal that you don't neglect them. Diverse perspectives for various requirements. The chart diagram has distinctive perspectives that show the bars in light of your project structure or the task begin dates. Everything about the task, including rate finish, time span, begin date, end date, and proprietor, is demonstrated appropriate here. 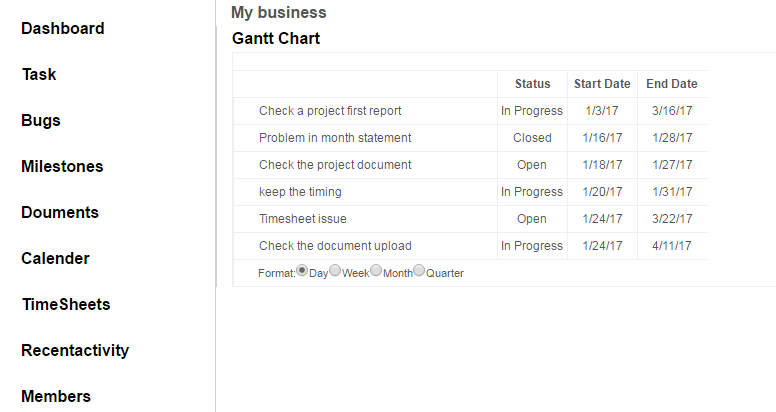 The day view of the gantt chart provided detail of each day in bug progress. The weekly view of the gantt chart provided detail of week in bug progress. The monthly view of the gantt chart provided detail of month in bug progress. The quartly view of the gantt chart provided detail of year in bug progress.